Photo by Pamela Chandler. © Diana Willson. Used with permission. John Ronald Reuel Tolkien (1892–1973) was a major scholar of the English language, specialising in Old and Middle English. Twice Professor of Anglo-Saxon (Old English) at the University of Oxford, he also wrote a number of stories, including most famously The Hobbit (1937) and The Lord of the Rings (1954–1955), which are set in a pre-historic era in an invented version of our world which he called by the Middle English name of Middle-earth. This was peopled by Men (and women), Elves, Dwarves, Trolls, Orcs (or Goblins) and of course Hobbits. He has regularly been condemned by the Eng. Lit. establishment, with honourable exceptions, but loved by literally millions of readers worldwide. Meanwhile Tolkien continued developing his mythology and languages. As mentioned above, he told his children stories, some of which he developed into those published posthumously as Mr. Bliss, Roverandom, etc. However, according to his own account, one day when he was engaged in the soul-destroying task of marking examination papers, he discovered that one candidate had left one page of an answer-book blank. On this page, moved by who knows what anarchic daemon, he wrote “In a hole in the ground there lived a hobbit“. In typical Tolkien fashion, he then decided he needed to find out what a Hobbit was, what sort of a hole it lived in, why it lived in a hole, etc. From this investigation grew a tale that he told to his younger children, and even passed round. In 1936 an incomplete typescript of it came into the hands of Susan Dagnall, an employee of the publishing firm of George Allen and Unwin (merged in 1990 with HarperCollins). She asked Tolkien to finish it, and presented the complete story to Stanley Unwin, the then Chairman of the firm. He tried it out on his 10-year old son Rayner, who wrote an approving report, and it was published as The Hobbit in 1937. It immediately scored a success, and has not been out of children’s recommended reading lists ever since. It was so successful that Stanley Unwin asked if he had any more similar material available for publication. By this time Tolkien had begun to make his Legendarium into what he believed to be a more presentable state, and as he later noted, hints of it had already made their way into The Hobbit. He was now calling the full account Quenta Silmarillion, or Silmarillion for short. He presented some of his “completed” tales to Unwin, who sent them to his reader. The reader’s reaction was mixed: dislike of the poetry and praise for the prose (the material was the story of Beren and Lúthien) but the overall decision at the time was that these were not commercially publishable. Unwin tactfully relayed this message to Tolkien, but asked him again if he was willing to write a sequel to The Hobbit. Tolkien was disappointed at the apparent failure of The Silmarillion, but agreed to take up the challenge of “The New Hobbit”. This soon developed into something much more than a children’s story; for the highly complex 16-year history of what became The Lord of the Rings consult the works listed below. Suffice it to say that the now adult Rayner Unwin was deeply involved in the later stages of this opus, dealing magnificently with a dilatory and temperamental author who, at one stage, was offering the whole work to a commercial rival (which rapidly backed off when the scale and nature of the package became apparent). It is thanks to Rayner Unwin’s advocacy that we owe the fact that this book was published at all – Andave laituvalmes! His father’s firm decided to incur the probable loss of £1,000 for the succès d’estime, and publish it under the title of The Lord of the Rings in three parts during 1954 and 1955, with USA rights going to Houghton Mifflin. It soon became apparent that both author and publishers had greatly underestimated the work’s public appeal. The Lord of the Rings rapidly came to public notice. It had mixed reviews, ranging from the ecstatic (W. H. Auden, C. S. Lewis) to the damning (E. Wilson, E. Muir, P. Toynbee) and just about everything in between. The BBC put on a drastically condensed radio adaptation in 12 episodes on the Third Programme. In 1956 radio was still a dominant medium in Britain, and the Third Programme was the “intellectual” channel. So far from losing money, sales so exceeded the break-even point as to make Tolkien regret that he had not taken early retirement. However, this was still based only upon hardback sales. The really amazing moment was when The Lord of the Rings went into a pirated paperback version in 1965. Firstly, this put the book into the impulse-buying category; and secondly, the publicity generated by the copyright dispute alerted millions of American readers to the existence of something outside their previous experience, but which appeared to speak to their condition. By 1968 The Lord of the Rings had almost become the Bible of the “Alternative Society”. This development produced mixed feelings in the author. On the one hand, he was extremely flattered, and to his amazement, became rather rich. On the other, he could only deplore those whose idea of a great trip was to ingest The Lord of the Rings and LSD simultaneously. Arthur C. Clarke and Stanley Kubrick had similar experiences with 2001: A Space Odyssey. Fans were causing increasing problems; both those who came to gawp at his house and those, especially from California who telephoned at 7 p.m. (their time—3 a.m. his), to demand to know whether Frodo had succeeded or failed in the Quest, what was the preterite of Quenyan lanta-, or whether or not Balrogs had wings. So he changed addresses, his telephone number went ex-directory, and eventually he and Edith moved to Bournemouth, a pleasant but uninspiring South Coast resort (Hardy’s “Sandbourne”), noted for the number of its elderly well-to-do residents. Meanwhile the cult, not just of Tolkien, but of the fantasy literature that he had revived, if not actually inspired (to his dismay), was really taking off—but that is another story, to be told in another place. 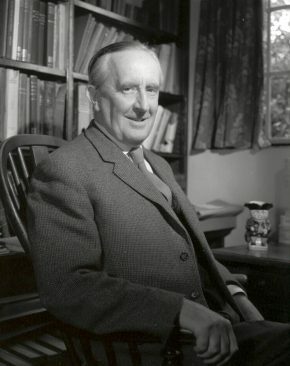 Despite all the fuss over The Lord of the Rings, between 1925 and his death Tolkien did write and publish a number of other articles, including a range of scholarly essays, many reprinted in The Monsters and the Critics and Other Essays (see above); one Middle-earth related work, The Adventures of Tom Bombadil; editions and translations of Middle English works such as the Ancrene Wisse, Sir Gawain, Sir Orfeo and The Pearl, and some stories independent of the Legendarium, such as the Imram, The Homecoming of Beorhtnoth Beorhthelm’s Son, The Lay of Aotrou and Itroun—and, especially, Farmer Giles of Ham, Leaf by Niggle, and Smith of Wootton Major. The flow of publications was only temporarily slowed by Tolkien’s death. The long-awaited Silmarillion, edited by Christopher Tolkien, appeared in 1977. In 1980 Christopher also published a selection of his father’s incomplete writings from his later years under the title of Unfinished Tales of Númenor and Middle-earth. In the introduction to this work Christopher Tolkien referred in passing to The Book of Lost Tales, “itself a very substantial work, of the utmost interest to one concerned with the origins of Middle-earth, but requiring to be presented in a lengthy and complex study, if at all” (Unfinished Tales, p. 6, paragraph 1). J.R.R. Tolkien Timeline. The Tolkien Society. Online, 2014. Tolkien: A Biography. Humphrey Carpenter. Allen and Unwin, London, 1977.
Letters of J.R.R. Tolkien. Ed. Humphrey Carpenter with Christopher Tolkien. George Allen and Unwin, London, 1981. The Tolkien Family Album. John Tolkien and Priscilla Tolkien. HarperCollins, London, 1992. Tolkien and the Great War. John Garth. HarperCollins, London, 2002. Tolkien at Exeter College. John Garth. Exeter College, Oxford, 2014. “On J.R.R. Tolkien’s Roots in Gdańsk“. Ryszard Derdzinski. 2017. The J.R.R. Tolkien Companion and Guide. Wayne G. Hammond and Christina Scull. 2nd edn. HarperCollins, London, 2017. 3 vols.